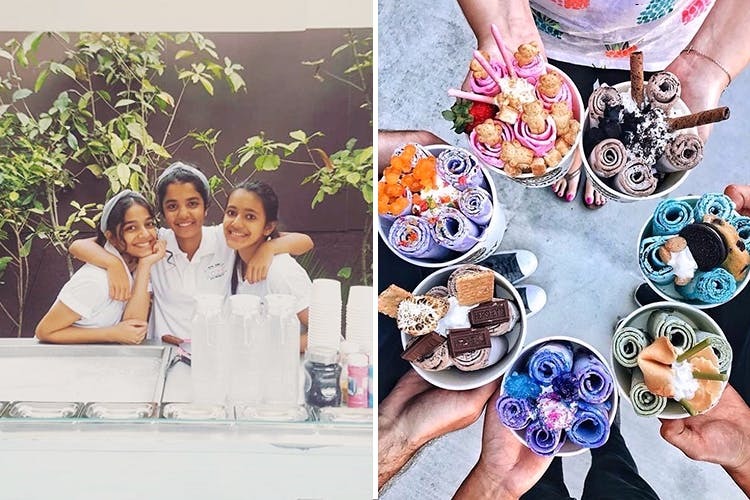 While there are multiple ice cream carts in the city, what makes Iceonic special and unique is that it not only makes some of the yummiest ice cream rolls we’ve tried in Pune, but is owned by three super-talented 14-year-old entrepreneurs. Located near Atelier Homes on North Main Road, Iceonic is the brainchild of three 14-year-old kids – Tanya Nangpal, Simran Jadhav and Aniya Mhalas. The idea came to them a couple of years ago when they wanted to establish a cart that sells nitrogen liquid ice cream. However, after much deliberation, they decided to go for an ice box and create fresh ice cream rolls in yummiest of flavours. Our recommendations? We hear the unicorn ice cream is one of their bestsellers and comprises bubblegum flavours with sprinkles and gems. Coffee lovers, we think their white mocha with chocolate sprinkles is worth a try. And, since it’s already the season, must try their ‘more mango’ ice cream for INR 150. Iceonic is open only during the weekends (Friday – Saturday), between 5.00 pm and 9.00 pm. For more details, check them out on Facebook or call them at 08806630003.